it's mothpool ! i love this ship, and from the poll i hosted on my page, it seems like it's a fan favorite ! two sweet medicine cats that are in love and you cant convince me otherwise !! I love this ship so much. Good girls!! im so happy you like them -- i think they're super cute together !! also i haven't kept up with the series since power of three, but i heard what happened to my sweet medicine girl. i miss her already. she wasn't even my favorite character, but she deserved better. She wasn't my favorite either, but I did like her character. Its just so sad, I mean, shes been around since series 2, so killing her is very sad to me. I like the headcanon that she takes care of Squirrelflight's dead kits in StarClan like Squirrelflight did to the three. Also I really like your style a lot, it looks very nice and unique! And I like the designs in here, mostly Mothwing's design, she sure looks a lot like her mother in here. They look so sweet together! thank you so so much, honey bee !! ;o; i'm so happy you like them, and i'm so happy you think highly of my art style ! i wanted mothwing (her siblings, too) to have that vague siamese design like sasha, her momma was super pretty. it's actually a design i found from a tumblr blog, but i've been having trouble finding them to give the proper credit, i'll link it when i find it ! 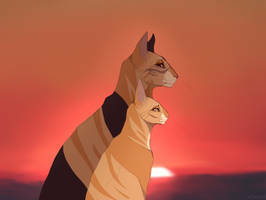 Aaa its very fitting for both of them, plus we got too many Tigerstar clones pft. And oh, I have seen something similar to this. Is it this art? it's not that, but i really love those designs !! i love hawkfrost's and that tawnypelt is a big strong girl !! it's here - ren-astraea.tumblr.com/post/16… ! Aaa ok. Tbh I love them too, they are very inspirying! Aaah I see, ah damn those designs looks very nice and fitting! mothpool is very in and trendy atm, this is true. this is the sweetest thing ,,, thank you so so much, lovely !! im so happy i could make your heart feel happy and warm -- theyre good girls, they deserved the world ! Absolutely adorable,, I love your mothwing design OMG! thank you so so much, honey bee ! AH, this is sooo cute and nicely drawn ! thank you so so much !! i feel the same about them - but i know they're fan favorites, especially as a ship, and i like them as a couple ! they were fun to draw ! Beautiful artwork! The pose reminds me of the artwork I did of Thistle x Snow. The designs are beautiful as well! thank you so so much !! i really appreciate it ! i love thistle x snow too ! little scheming cuties ,, maybe this was before certain events, and they were plotting to get back at hawkfrost for being mean to his sister !